In recent years, our world has experienced a profound shift and progression in available computing and knowledge sharing innovations. These emerging advancements have developed at a rapid pace, disseminating into and affecting numerous aspects of contemporary society. This has created a pivotal need for an innovative compendium encompassing the latest trends, concepts, and issues surrounding this relevant discipline area. During the past 15 years, the Encyclopedia of Information Science and Technology has become recognized as one of the landmark sources of the latest knowledge and discoveries in this discipline. 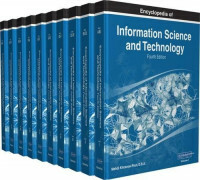 The Encyclopedia of Information Science and Technology, Fourth Edition is a 10-volume set which includes 705 original and previously unpublished research articles covering a full range of perspectives, applications, and techniques contributed by thousands of experts and researchers from around the globe. This authoritative encyclopedia is an all-encompassing, well-established reference source that is ideally designed to disseminate the most forward-thinking and diverse research findings. With critical perspectives on the impact of information science management and new technologies in modern settings, including but not limited to computer science, education, healthcare, government, engineering, business, and natural and physical sciences, it is a pivotal and relevant source of knowledge that will benefit every professional within the field of information science and technology and is an invaluable addition to every academic and corporate library. This book addresses the most important techniques in improving the correctness of software, including correctness by construction (top-down refinement), program proving, static analysis and dynamic, execution-based analysis (testing and debugging).